The latest news stories from our club. Simon Plummer scored an emphatic victory on the undulating country lanes of the Pewsey Vale half marathon, leaving the rest of the field almost a mile behind despite slowing up in the final miles. On schedule for a 13mile clocking of 70minutes, the City of Salisbury club athlete eventually conceded to the effects of running alone at the front, and slipped to 72min 38sec – still quick but not a full reflection of his current good form. Satisfying though this third win in his last three three races was, Plummer’s race plan is to move up quickly to some top events in the autumn where he knows he will be up against high class competition: the first is the international Bristol half marathon next month. Further down the field at Pewsey, Clive Smith ran in company with the improving Kate Mansfield to help her reduce her best time at the distance by some five minutes to a creditable 1hour 40mins. City of Salisbury Athletics Club’s road runners are looking for a flying start to the new Hampshire League racing season to set up an even better outcome than last year in the 12 race contest. The season kicks off in September with two five mile fixtures which favour some of the club’s short distance specialists. With consistently good quality results last season from Stuart Holloway, Chris Southern, Aaron Wilson and Kevin Tilley, and with a number of other capable athletes also bidding for a place among the points-scoring quartet, the A team’s third place overall was well earned against tough opposition from far bigger clubs such as Winchester and Southampton. Salisbury ladies’ team taking equal second overall last year was far beyond their expectation. Led by Katie West and strongly supported by Sally Greenslade, Fiona Ross-Russell, Sarah Kemp and Katherine Bleakley the squad’s result was simply outstanding and not easy to improve on in the coming season. The Overton 5mile race is on Saturday Sept 1st and is followed just a fortnight later by the Victory 5mile at Portsmouth on Sept 16th. Then the race distance extends to 13miles with the Solent half marathon on Oct 14th, followed by the Lordshill 10mile on Nov 4th and the Gosport half marathon on Nov 18th. The Stubbington 10k is 2013’s first league fixture on Jan 20th and then in February comes the hilly Ryde 10mile on the 3rd followed a week later by the longest race in the series, the Bramley 20mile race at Reading. The Salisbury club’s highly regarded 10mile race up and down the Woodford Valley and finishing on the running track at Five Rivers leisure centre is on March 10th then comes the Eastleigh 10k on Mar 24th and the Alton 10mile on May 12th before the final league positions are calculated after the Netley 10k on May 19th. Less than a minute separated City of Salisbury runner Chris Southern from the winning time at the Yeovil 5k road race despite a good performance of 16mins 34sec on the fast, flat course. But that could not prevent him being pushed down to fifth place behind a speedy Jack Bancroft of Wells City Harriers and a highly competitive leading group at the front. Next Salisbury man was Thomas Cummings with 16.57 for an encouraging seventh spot, and he was followed by the ever improving runner and triathlon prospect Hannah Drewett who clocked 18.48. 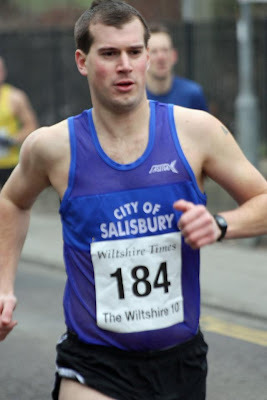 Simon Wiltshire was next of the club’s finishers in 20.29 to secure his place in the top half of the field, and Aly Sloane completed the squad with a time of 21.09.
n the five event Salisbury fire station’s trail running series, City of Salisbury athletes packed the start lists and more than twenty successfully completed their chosen distance. Most popular was the 21k, half-marathon route, won in warm conditions by Ben Brewster in 1hour 20mins 55sec and he was followed by Rithy Hy in fourth with 1.39.42 and Sally Greenslade sixth in 1.40.52. Then came Nick Willetts in 1.48.52, James Murphy 1.59.37, Lizzie Clapp 2.0.06, Alan Sawyer 2.2.26, Melani Murphy 2.2.34, Tom Bradley 2.5.05, Alison Theobald 2.18.04, Bob Witt 2.36.37 and Jeanette Hardiman 2.36.38. Kelvin Farmaner was the sole representative in the 10k and he clocked 52.14. Kate Mansfield was quickest Salisbury runner in the 30k with 2.48.35 and she was chased home by Ruth Thom who clocked 2.49.46,Liz Roberts 3.26.41, John Gorham 3.38.09, Chrissie Gorham 3.38.10 and Hilary Webber 3.47.46. At the full marathon distance of 42k David Osment stopped the clock at 4.23.52 and Ian Leaver 5.23.01 while in the 50k Phil Smithcompleted the day’s racing with 5.30.44. Notching his second road running win in less than a week, Simon Plummer stormed home to take the Pewsey 5 mile race almost a full minute clear of his nearest rival. For the City of Salisbury man, his 25min 40sec run gave him his sixth win in the even t and although he was outside his own course record on the rolling country roads, the result gave him the assurance that his recent training spell has produced the form he has been looking for. Next Salisbury finisher was Ian Stott who marked his recent elevation to veteran status by finishing in eighth spot with 29.17, and he was followed by a good performance from Nikki Hazzard with 32.11. Simon Wiltshire clocked 33.42, Alan Sawyer 35.59 and on her way back from injury, Fiona Ross Russell completed the Salisbury line-up with 36.24. In the gruelling Lakeland 50 mile race with more than 3,000 metres of ascent along the way earning it the dubious title of one of Europe’s toughest endurance events, Salisbury’s ultra distance specialist Phil Smith did well to finish in 12hours 53mins. City of Salisbury Athletics Club’s trip to Oxford in the season’s final Wessex League match started with a bang when Jacob Collins smashed the Salisbury shot put record with a throw of 9.73m. The promising under-13 year-old went on to win the 100m in 13.62 seconds and notch a personal best in the high jump with 1.35m. Toby Randerson followed by taking the sprint double; Megan Price won her high jump with 1.3m; Maisie Grant battled hard to win the 1200mwith an impressive 4min 7sec and Heidi Porter continued her fine season by winning the 800m, supported by Tasha Mundell who won the B event. Salisbury dominated the middle distance events with Emma Clarke winning the U17 1500m, Sam Rogers the 1500m A race and Tom Torocca the B string. Jordan King clocked his fastest ever 800m in an impressive 2min 3sec supported by Lewis Hunt who won the B string. Alex Mundell made light work of winning the 800m and then she too ran a personal best to take the 300m win. With great performances also from Freya Espir and Marie Clarke, the U17 women’s team won their event, joined by the U17 men’s team, who spectacularly won every single track A & B string event including the hurdles where Abbey Babatunde and Hamish Mundell ensured maximum points. Both Jake Ness running a fast 23.10sec for 200m and Andrew Pryde, 11.37sec for 100m showed their unbeatable form in more than one event and in the field Sam Rogers and Mundell took victory in the high jump competition while Babatunde and Joe Willicombe did well in the long jump. Overall the team came an impressive second against the much bigger clubs of Oxford, Newbury, Winchester and Slough. On the road, Ben Brewster was the club’s only runner in the Bishop’s Waltham 5mile, taking fourth place behind Winchester’s Toby Lambert with a time of 33min 28sec.